A 4 hour journey from Indore in the wee hours of the morning and we arrived at a village in our new district of Khandwa, Madhya Pradesh. There to attend a door-to-door survey, we were told we will also be part of the social mapping process done prior to the door-to-door survey. A quick Google search (which took a few minutes to download as most of these areas have poor or no network) revealed that it is a visual method of showing the relative location of households and the distribution of different types of people (such as male, female, adult, child, landed, landless, literate, and illiterate) together with the social structure and institutions of an area. We were now excited to see how it really worked. 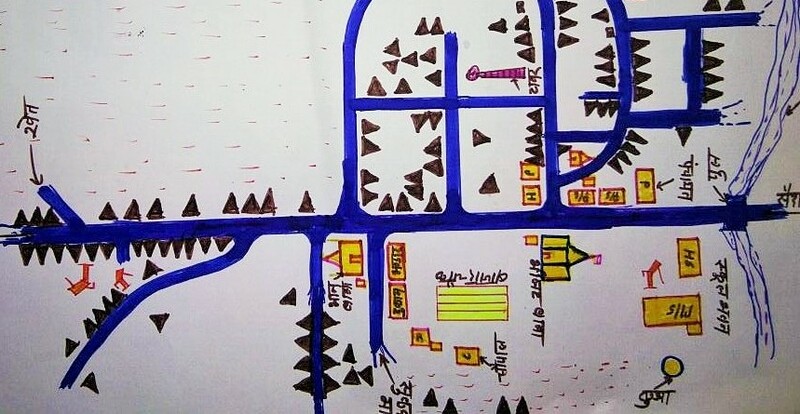 Block officer Avinash had intentionally chosen a central location to have the social map drawn out. Slowly the crowd gathered to know what the hoo-ha was all about. We were eventually surrounded by quite a number of men, their wives (though they were quietly sitting in a corner), and most importantly children, who were curious to know what all the vibrant colors on the street of their village were about. The up-sarpanch (deputy-head) of the village seemed to be at the forefront of the activity. I was wondering where the Sarpanch (head) was, only to realize that the village actually had a female Sarpanch who was represented by her husband. It was fairly evident who were the ones supporting the up-sarpanch, and who were the ones quietly mumbling in the corner about their own apprehensions regarding the activity. We could not comprehend the quiet discussions as they were speaking in a local dialect. On requesting the field coordinator to translate, we learned that they were discussing the futility of education and how some of them had to leave their education midway to work and feed their families. The door-to-door survey later revealed that the major impediment to education was putting children to work to support the meager family income. Once the map was finalized – we started the door-to-door survey. It was great to see some of the men and children following and supporting us, directing us to their houses and letting us know about the statistics of empty households where the families were working on fields. We pretty much followed one of the 3 teams of field coordinators and were able to complete the door-to-door survey of 97 households in 4 hours. Our activity of enrollment, retention and improving learning outcomes are still a while away for this block, but social mapping was definitely a great way to start our endeavor of Educating Girls!